It is little known that that London suffered its first air raid not in World War Two, but just over one hundred years ago, in May 1915. Bombs were dropped not from planes but from the German Zeppelin airships. It is even less well known that ten years previous to that, a similar dirigible or directional air ship had taken off from Alexandra Palace. Its creator, Dr Francis Alexander Barton, was a general practitioner in Beckenham, Kent who had been obsessed with things aeronautical from an early age, possibly experimenting as early as the 1880s. What is certain is that he was granted a patent for ‘an improved aerial machine or airship’ in 1899. By 1901 he had sufficiently interested the War Office Ballooning Section to contract with them to create and sell them a machine. His next problem was to find somewhere to construct a shed for the airship. He rejected the War Office’s suggestion of Fort Clarence in Chatham and began negotiations with the Trustees of Alexandra Palace. It is possible that the decision to come north was influenced by a Frenchman, A E Gaudron, who was already involved in balloon ascents and parachute descents in the Park. The Trustees possibly hoping to attract more people to the Palace made him a grant of £500 towards building the shed, which was situated where there is now a football pitch, behind the lake side cafe and boathouse. Barton’s work was totally self-financed, without any support from the Government. At the same time Count von Zeppelin was working with financial assistance from the German Government, which enabled him to have lightweight aluminium for the car of the ship, while Dr Barton had to use much heavier bamboo. The balloon of the airship was made of two layers of tussore silk varnished with linseed oil and was 180 feet long and 40 feet in diameter, pointed at one end and tethered to the car with webbing lines. It took 50 tons of iron filings and 600 carboys of sulphuric acid to generate sufficient hydrogen to inflate it and the cost of doing so with labour was £400. Barton’s contract with the War Office ran out in August 1903 and when storm damage to the shed caused a partial deflation of the balloon and Dr Barton could not afford to pay for more hydrogen, it did not fly in 1903. In 1904 an explosion occurred while generating the gas and so it was not until July 1905 that the airship was ready to fly. By then after storage in the Palace for two winters, the silk was beginning to deteriorate and so it could not be inflated to its maximum capacity, meaning that important features of the airship design had to be ditched because of weight limitations. The Trustees of Alexandra Palace invited the public to attend its first flight on 22 July 1905 and they and many representatives of the War Office and Aero Club saw it take off at 5.10.pm. Barton and his six companions flew in a north easterly direction, eventually coming to land in a potato field at Romford an hour later. The jubilant rush of the crew to congratulate each other, destabilised the craft necessitating the use of a ripping valve to release the gas and this split the balloon; it would fly no more. By World War One Dr Barton had returned to medicine and as the ultimate irony, was working as a locum in Norwich when the Zeppelins flew over to bomb this country. Had his work been financially supported who knows what might have been. 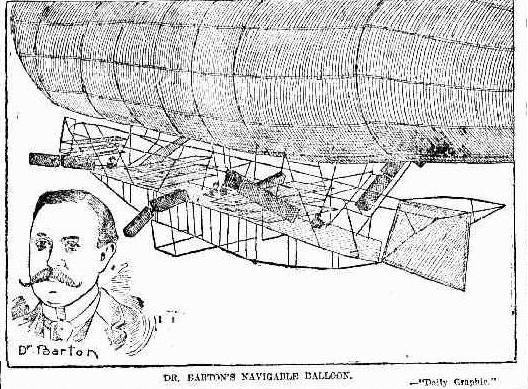 For more detail see Hornsey Historical Society’s Bulletin 51 (2010), Eleri Rowlands, ‘Dr Barton and his Airship’.